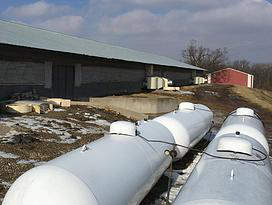 Energy savings have been monitored at two broiler barns in Pettis County, Missouri, while two other barn were kept unchanged as control. Daily propane consumption in both WHR equipped barns and control barn are shown in the following chart. The majority of savings occurred in second and third week. There is almost no need for propane after four weeks. Waste heat from warm exhaust air is used to preheat cold fresh air. 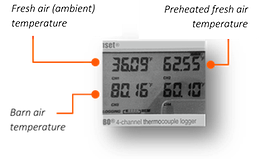 An example shown below indicates the air is heated to 62.55°F. It should be noted the fresh air delivered to the barn is better than the natural warm air from outside because it contains less moisture. 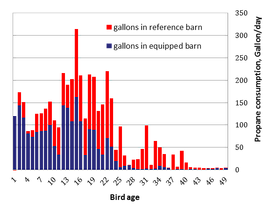 Other sample temperature records show outdoor fresh air with temperatures of 27.47°F and 8.61°F, which were heated to 53.90°F and 49.97°F with high temperature waste air of 77.7°F, and 74.94°F.